It is clear that in 2010 such features were typical of top solutions, which made them expensive with a limited pool of possible components. For example, by limiting the chipsets only to those produced by Qualcomm, Microsoft helped the hardware giant at their own expense. Phone manufacturers could not differentiate between their solutions as they were not allowed to use alternative components. Microsoft understood their mistake, but could implement changes only in the next version of OS and in 2012 WP8 will be able to run on any chipset. When I mentioned 512 MB of RAM I was not mistaken, because during MIX10 we were promised 256 MB even for Tango (initially only LG Quantum/Samsung Focus had such RAM size). Tango will be an attempt to use WP7 on such devices. The key mistake of Microsoft was not submitting a minimum set of requirements, but a fixed range of components to choose from, especially in terms of processors. On one hand Qualcomm is known to all phone companies, but its pricing is far from perfect. Samsung offers rival solutions with lower price and better efficiency. Using their own processors Samsung could have offered superior value for money, but Microsoft was against. As a result models on WP7 differed only by the screen size and design. Prices were similar too (in US carriers were different for each particular model, which diminished competition even further courtesy of identical prices at all times). To crown it all Microsoft thought it to be a bad idea to allow partners alter the user interface in WP7. It had to stay the same. Subsequently customers ended up with models featuring identical hardware, software and price. There was no difference between products created by LG or Samsung/HTC, so manufacturers tried to stand out with their design. They were not original as they took existing solutions on Android and changed them slightly. Unfortunately, WP7 did not get its own face inside or outside. Microsoft succeeded in flooding the market with identical solutions, which had to ensure consistent user experience. They managed to get a simple and fast phone to fight with Apple iPhone. Unlike the latter phones were devised by different companies, but the end product was the same. For manufacturers it was a sheer failure and to add insult to injury sales were dismal. As a result they switched interest to Android and froze the development of WP7 phones until further notice. In the absence of competition in hardware and UI they saw no point in the exercise. As a comparison look at smartphones running Android OS. They can utilize ANY chipset available on the market including accessible MediaTek solutions. The disadvantage lies in potentially different user experience due to the different OS speed, but in return Android gets a foothold in all segments starting with $100 and up. Every manufacturer is free to experiment, because it is their business risk. Moreover, every company may change Android interface (resulting in numerous combinations of varying degree of success), preinstalled apps and services. The development of Android smartphones is extremely flexible – you can use a “bare” OS with minimum hardware requirements or come up with an advanced and expensive solution. Subsequently, the share of Android smartphone increased by hundreds of percentage points annually in stark contrast with WP7 phones. It is necessary to remember that the Android market is vertical and contains phones, players, multimedia devices, navigation and car systems, tablets and even laptops. The multifaceted nature of the OS makes it even more attractive for producers. The lack of understanding how the market works made Microsoft create an Apple iPhone replacement based not on internal developments, which were nonexistent, but relied on a range of manufacturers. The strategy could not succeed and it finally led to a complete failure. An idea of a fast smartphone functioning as an alternative to Apple iPhone run into trouble both in the manufacturing and marketing areas. 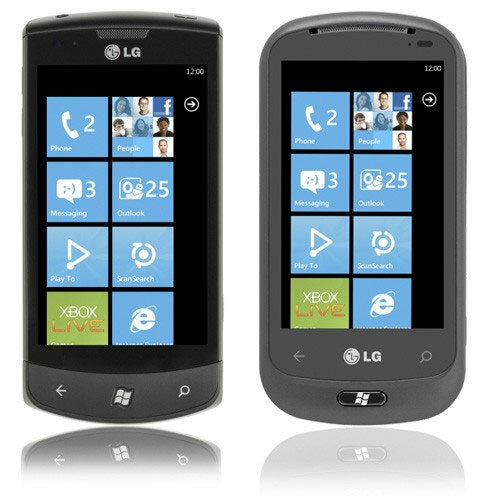 The pricing was not an issue, because WP7 handsets are the cheapest for solutions with comparable features. Reading this section one should bear in mind the story about the licenced WP7, which will complement the following very well. Let's look at how Microsoft decided to compete with Apple on the US market, where in November of 2010 several WP7 smartphones hit the shelves. Apple iPhone 4 was already available and its price together with a 2-year contract from AT&T was $200 for first-time subscribers (or $300 for regular AT&T clients). Can you guess the price of WP7 smartphones available from US carriers? The correct answer was $199.99. Microsoft marketologists were going to conquer the world. Look at the following table. Not surprisingly, identical phones cost the same. Microsoft was still planning to create a monster to beat Apple iPhone. At the time of launching first WP7 handsets the question was if the iPhone hegemony would come to an end or not. Many compared features of two solutions, for example in PCWorld. Unfortunately, there was no real advantage over Apple iPhone 4 by the time WP7 solutions reached the stores. One of the different elements in WP7 phones was the screen, but it lost out to Retina from Apple. Sadly for Microsoft Apple highlighted the screen quality and made sure consumers knew about it. I am not even going to mention that by the time the Apple ecosystem already boasted 270,000 apps for iPhone, which further increased its desirability for customers. On top of that the number of iPhone owners in US easily exceeded those of previous Windows Mobile versions. Apple had a competitive advantage, but Microsoft people went for a head-to-head battle of products to see who is stronger. The impact was tremendous. This is how WP7 lost half of their initial value two months after the sales started. The demand was humiliatingly low and emphasized the incompetence of Microsoft employees, who planned to charge the price similar to that of Apple iPhone 4. Interestingly, manufacturers and carriers wanted to sell the models at lower prices, but Microsoft persuaded partners their product will give Apple iPhone run for their money. The situation turned out to be exactly the opposite. Two more months the price of $99.99 showed that carriers were losing patience and could not sell out first stock of phones acquired prior to the initial sales. In March 2011 the price further dropped to $49.99. Nevertheless not many wished to buy WP7 products even at inflated prices. Closer to the summer on Amazon appeared offers for WP7 at the price of $0.99 with a 2-year contract. Microsoft professionals made a huge pricing mess and based their predictions on internal data, which somehow showed that consumers were crazy about WP7 handsets, though it was not true. Do you think the first year of US sales taught Microsoft anything? Have the company managed to create appropriate forecasts on the home market? The answer is a resounding no. 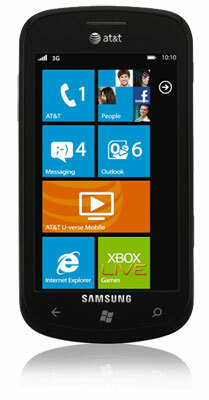 For example, Samsung Focus S was available from AT&T in October of 2011 at the contract price of $199.99. Not only Focus S experienced low sales, which was to be expected, but the whole image of Microsoft was under threat as it planned to improve results with the Mango update, supposedly fixing all existing bugs. The manufacturer could lower the price, so in November of 2011 AT&T, Amazon and several other carriers had promotion campaigns offering phones for free if you signed up for a 2-year contract. All solutions were on WP7, and included the latest Mango phones. The same was happening in the Microsoft store in November of 2011 – phones were given away for free with a 2-year contract. Carriers keep the price at $199.99 due to another reason too. Their purchases are much lower if compared with the end of 2010. They no longer believe into the bright prospects of WP smartphones. There is a strong myth that WP7 smartphones are too expensive, which blocks their market path to success. To my mind the situation at least in the US is the opposite as such solutions are among the most accessible there even among phones in general, let alone smartphones. The price difference with Apple iPhone 4s is around $199.99, while the contract conditions are the same. These phones belong to different price ranges. In 2012 carriers learned a lot. For example, AT&T declined to sell Nokia 900 Lumia for $199.99 with a 2-year contract and it is now available for $99.99. Will it save the sales of WP7? Obviously not! The demand is so low that even for free with a 2-year contract these phones cannot find new owners. For the same amount you can get Apple iPhone 3Gs from 2009, so the overall prospects of WP7 devices look bleak. 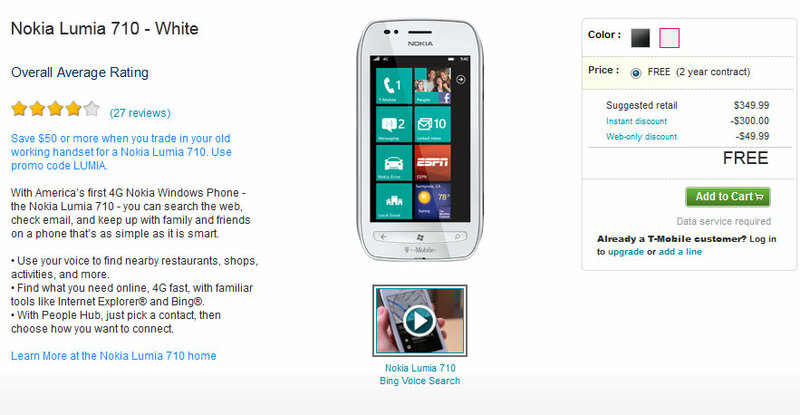 Can you sell a WP7 phone for less than $0? In November of 2010 AT&T had a promotion campaign when buyers of one phone get another one for free, because they needed to sell off their stocks. 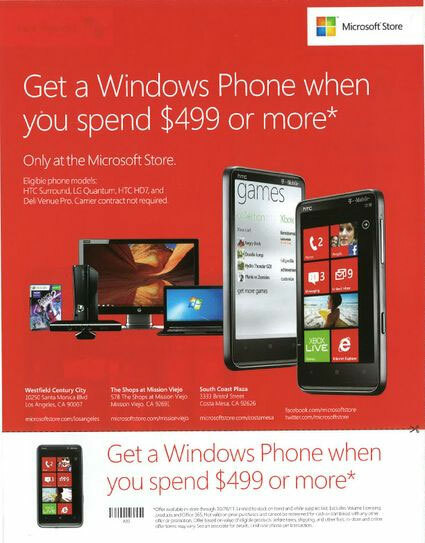 In the fall of 2011 Microsoft began giving away old phones to everyone, who spent at least $499 in their store. You could also get a WP7 phone as a prize in many Microsoft promotion campaigns too. It's a pity that Microsoft still does not get how this market works and how the prices must be set. Nokia 710 Lumia from T-Mobile in USA was launched on January 11, 2012 for $49.99 with a 2-year contract. Ten days later the demand was so weak, that the price reached $0. Do you need any comments about the way customers see WP7? I decided to have a separate section about the WP7 in Europe, because secondary markets can differ from the primary one. Nevertheless, there was not much difference from US events at the end of 2010 – start of 2011. By the summer of 2011 European WP7 phones were offered for 0.5 Euros, but the demand was rock bottom. Carriers were so desperate that online auctions were filled with unlocked offers. For example, in Germany one could buy HTC Mozart for 180-200 Euros, while its price in carriers branded stores was 479 Euros. The deal was very lucrative, but even this could not boost flagging sales. The only optimism appeared when people learned to run Android, but not many were eager to experiment. At the end of 2011 the appearance of Nokia WP7 handsets showed that the company makes similar mistakes in pricing. Look at the following table, which needs not much explanation. The price of two WP7 models went down 19.5% and 27% respectively, which completely repeats the case of WP7 products in 2010 and 2011. The curse of WP7 has the sole explanation in the incompetence of Microsoft in the mobile universe. There is no other explanation. While WP7 was still being planned Microsoft understood that the chassis specifications would not allow production of low and mid-range WP7 phones so they came up with the Tango concept that would allow production of WP7 phones with as little as 256 MB of system memory and screen resolutions as low as 320x480 (they announced it at MIX 2010). However, due to a number of reasons the prices for regular WP7 phones had to be slashed and the budget series concept had to be brought back to the drawing board. Why would anyone want to buy a budget version of flagship phones if the latter cost less? So without any ado Microsoft released Tango as a mere multi language pack available for Mango devices. Tango 1 and Tango 2 each will bring more languages to Mango. So Tango turned into expansion into countries where WP7 devices had not been yet localized (except for China where Tango will actually stand for different hardware platforms allowing 3 MPix cameras and low-res screens). You might remember that two of the first WP7 generation phones had 256 MB of system memory so the issue of optimization is not a big one. Microsoft’s monstrous incompetence in price planning, market and rivals analysis doomed budget WP7 phones which could have become a complement to the 2011 WP7 series. 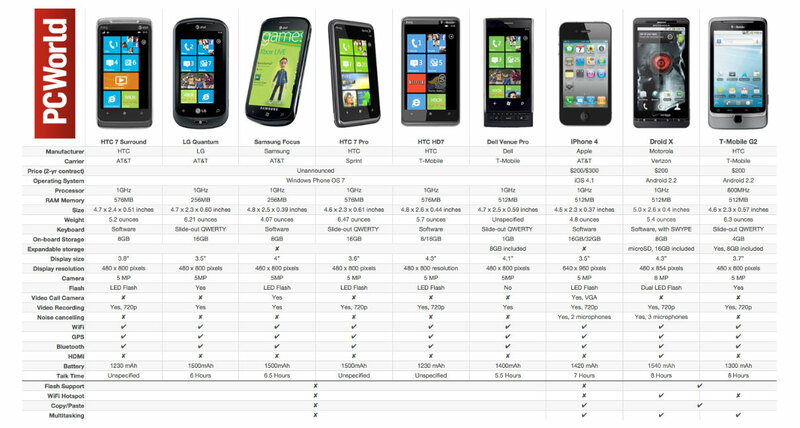 As a result of this we will only see hardware diversity in WP7 phones in 2013 with the second gen WP8 devices. Even though it’s ‘budget’ it packs 512 MB of system memory, a 1 GHz CPU (MSM8255), 4 GB of flash memory (no memory card slot) and a 5 MPix camera. It should have gone on sale in the UK for £250 ($390) without a plan in Q1 2012. With a two year plan it should be £10-20 according to ZTE. But because of the sharp cur of the Nokia 710 price (£150 with a two year Vodafone UK plan) ZTE had to drop the price for their phone to £199. But it was still not good or cheap enough to compete with the first gen WP7 phones. WP7 smartphones have been rapidly becoming more and more affordable since the release. The myth that WP7 popularity is limited by their price is a PR trick used by the interested parties. Microsoft’s pricing policy makes WP7 devices lose the competition before they are released. As a result the sales are poor and the prices are lowered regularly. Microsoft planned to create a cheaper series of the flagship WP7 series smartphones called Tango but since the prices for flagships have dropped so radically the whole idea became pointless except for the Chinese market. In 2012 Tango 1 and 2 are merely language packs for countries where Mango is not yet available and simpler versions of WP7 phones for China and a number of other Asian countries. Apple has proven that a manufacturer can corner a market offering only one device. But as long as there is Apple there cannot be a second player like this on the market. No, scratch that/ I mean that the competition on the mobile phone market will always single out one dominant product. Android is expanding everywhere iPhone does not go by offering a plethora of choices to any taste and money. But even the most popular Android flagships sell a lot less units than Apple iPhone. 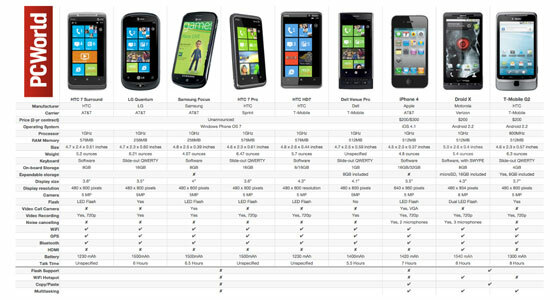 Let us now consider figures to see where exactly Windows Phone 7 can fit in this market. 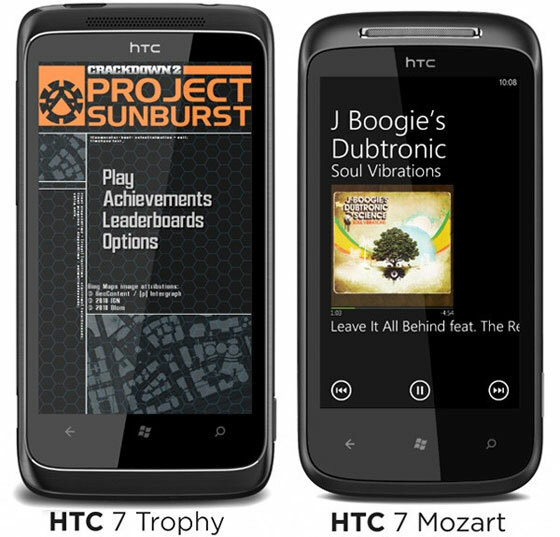 In October 2010 together with the announcement of the Windows Phone 7 release nine WP7 phones were presented (12 including carriers’ versions): HTC Mozart, HTC HD7, HTC 7 Pro, HTC 7 Trophy, HTC 7 Surround, LG Optimus 7/7Q/E900, LG Quantum, Samsung Focus, Samsung Omnia 7, Dell Venue Pro. A bit later ASUS joined in with their E600 WP7 smartphone. In fall 2001 manufacturers offered only six phones for the Mango update: HTC Radar, HTC Titan, Samsung Focus S, Samsung Omnia W, LG Jil Sander, Fujitsu IS12T. Twice fewer than a year before. And a few more phones announced a bit later: HTC Titan II (release date unknown, possibly late summer), Nokia 710, Nokia 800, Nokia 900 (April 8 in the US), Acer Allegro, ZTE Tania (March). 12 second gen models for Mango (I did not include a number Nokia models and their version for specific markets released in April since the dates are about the same). What do these numbers mean? The number of models illustrates how loyal the manufacturers are to a platform and since WP7 remains a risky investment for them it results in the manufacturers cautious approach. Samsung has not changed their strategy and still offers two WP7 models in different price ranges that find their buyers while remaining somewhat popular. Anyway, Samsung don’t expect anything more and invest a bare required minimum into them. WP7 is historically important for HTC because HTC has grown out of Windows Mobile but the recent success of the company lies with Android. Their 2010 attempt to jump onto the Windows Phone 7 train was somewhat successful and they managed to secure a share of the US market where their brand acquired certain recognition. In summer 2011 Fred Liu, senior executive vice-president, mentioned that every second WP7 smartphone sold is HTC. However, HTC were a lot less enthusiastic about the second gen WP7 devices and released their versions a lot later than their rivals and released only two models instead of five a year before. The reasons were more than moderate sales of the first gen devices and stockpiles of unsold handsets that became a burden. I can remember many loud statements on partnership with Microsoft. In 2009 an LG top manager claimed that the company is going to produce 50 Windows Mobile models assesses Windows Mobile perspectives as very positive. A year after another LG top manager mentioned the same figure – 50 models only this time on Windows phones. None of that happened and those statements are merely acts of courtesy toward their partner not backed by real deeds. We should be skeptical about promises and focus on facts. Among the current WP7 manufacturers, this OS is only top priority for Nokia for which this platform is the last chance of survival. The table below made by Nokia illustrates their vision of future. 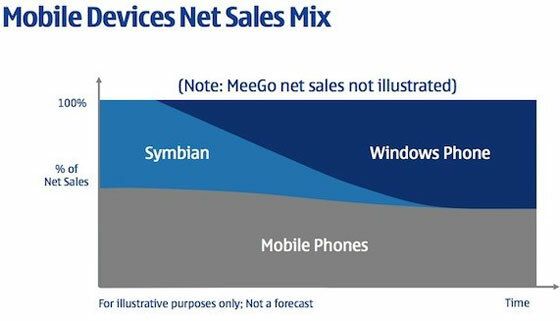 Unfortunately, Symbian sales plummeted so badly in 2011 and Nokia WP7 sales turned out to be a disappointed. Anyway, Nokia top manager have been so fixed on WP that they got some results. They spent the entire 2011 and 2012 so far doing everything to make Windows Phone 7 popular. In December 2011 95% of all WP7 smartphones sold in Russia were Nokias. This outstanding result was achieved by both active and aggressive marketing strategies and some Symbian users switching to WP7. Nokia used the popularity of their brand in Russia to make their users switch from Symbian to WP7. The bad news is that there are very few new customers among those users and the popularity of the Nokia brand is in decline. This might seem as good news for the WP7, but is it? Imagine a severely beaten heavyweight boxer on a ring. His face is swollen and covered in blood. He is matched with a fly weight boxer. He would you bet on? The heavyweight is exhausted but a single blow will send his opponent on the ground who will have to circle around the giant trying to avoid killer punches. I believe it would be next to impossible to defeat the heavyweight – he is just way too big for his opponent. This is how I see the Windows Phone 7 market. Even though Nokia is bleeding badly and is experiencing severe problems it is still a heavyweight player. And by putting everything they’ve got into the WP7 market they came to dominate this market. Only Samsung can put up some fight for the WP7 market but they have been rather standing aside the WP7 competition. Why? The reason lies in the US market. Samsung sees Windows Mobile and Windows Phone products as a tool for the US market as they have been historically most popular there. 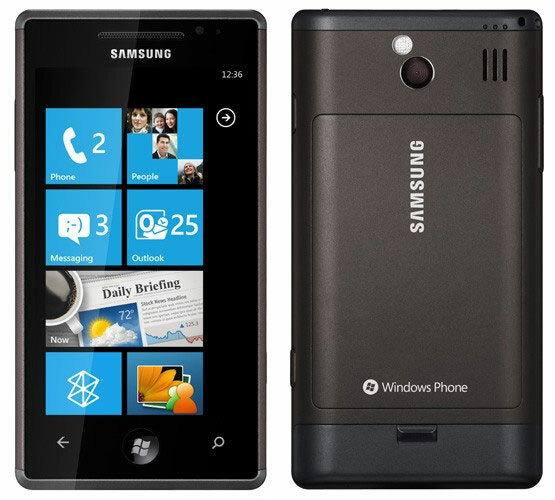 Why did Samsung change its strategy and leave so little attention to WP7 products now? The answer is simple – Samsung found Android a very fertile ground for growth and this OS allowed Samsung to compete with Apple. However, Samsung is number one on the US market thanks to their regular mobile phones not their smartphones although the share of the latter has been growing steadily. Naturally, Samsung is not going to ditch the Windows Phone 7 market but they are going to gradually decrease the number of WP7 models with priority to carriers’ orders as Samsung is not willing to invest into promotion of WP7 themselves. There has been a rumor since H2 2011 that Samsung but ditch any development for the WP7 market. This scenario is not completely out of the question. Here is a source of the rumor. The proof of that WP7 is not a priority for Samsung is the fact that Focus S was never released for Europe. This situation is usually cause by lack of orders from regional distributors who don’t see sales perspective for a model. It is a fascinating situation in which major players like Samsung and HTC and are that much into the market. What about LG? LG is struggling to release a mass product. Their Jil Sander model on Mango is strictly a narrow niche product. What about the smaller manufacturers? Dell has ditched their Mango devices development because the sales of Dell Venue Pro were catastrophically low. This article elaborates on the reasons Dell ditches WP7. ASUS, Acer and Fujitsu hardly have any effect on the market because their sales are insignificant. Anyway, they all offer one model on WP7 and might release a few more. Besides Nokia, only ZTE can have say on the WP7 market. ZTE focuses on budget WP7 (Tango/Mango) phones for Asian markets. 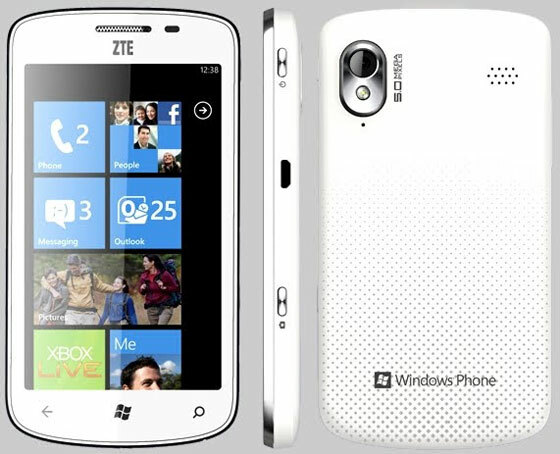 As of now ZTE has only been demonstrating their interest and have no real experience on WP7 market. The story of Android is different when it comes to the number of manufacturers. As of now about 50 different manufacturers use it on their devices. The very first Android was released in September 2008 and was meant mainly for developers and manufacturers although HTC released HTC Dream (G1) for the US market. Since spring 2009 and the release of Android 1.5 Android has been growing rapidly and a number of manufacturers released their phones on this OS. Since then the number of manufacturers has only been growing. This is a successful scenario of an OS development which never happened to Windows Phone due to a number of reasons. Back in the day, Windows Mobile was popular among lesser manufacturers as they saw it as a ticket to the smartphone market. The number of models on Windows Mobile was huge and the competition was heavy. Many smaller manufacturers offered cheaper phones than Nokia on Symbian or other OS. The fact that there are no small manufacturers on the WP7 market is very alarming and it is the biggest difference between the development of WM and WP7. 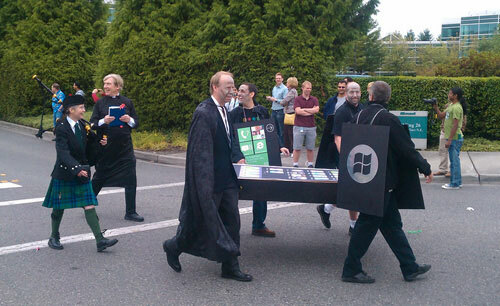 The contrast of Microsoft's hopes like in this 'funeral' of their competitors and the actual sales they got is striking. 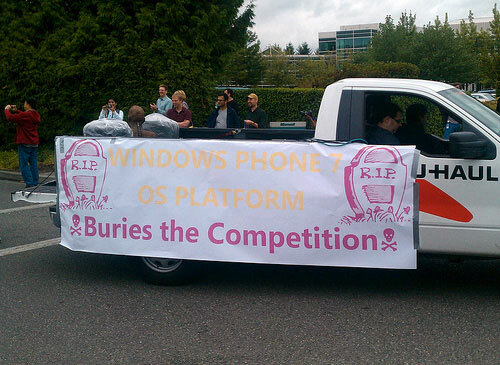 In 2010 On the streets of Redmond they were 'paying their respects' to Blackberry, Android and iPhone. A year later this event looked even more pathetic. the first generation WP7 manufacturers are very cautions now with Mango devices and are generally skeptical about the future of Windows Phone. In 2012 only Nokia is an active player on WP7 market. By sacrificing its assets Nokia is promoting WP7 and has the biggest share of WP7 market. Samsung, LG and HTC are not planning on actively participating in the competition on the WP7/8 market. Lesser manufacturers are not interested in WP7 either. Dell ditched their development, ASUS and Acer offer only a handful of models and occupy a very narrow niche which makes for the biggest difference between Windows Phone and Windows Mobile.